During September 2005, a salvage excavation was conducted at Tirat Karmel (Permit No. A-3945*; map ref. NIG 19780/74085; OIG 14780/24085), prior to the construction of a residential building. 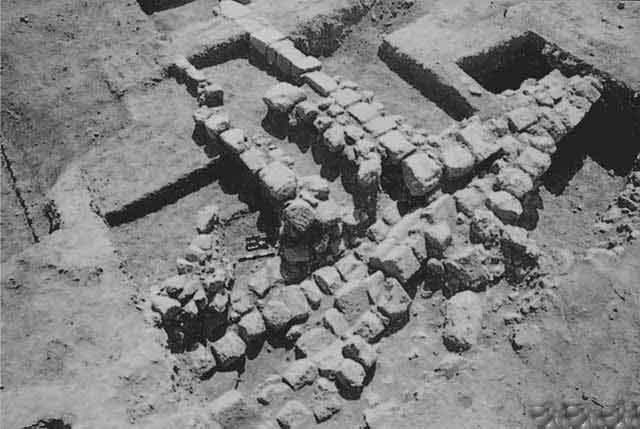 The excavation, undertaken on behalf of the Israel Antiquities Authority and underwritten by the Almog Company, was directed by O. Segal, with the assistance of S. Ya‘aqov-Jam (administration), V. Essman and V. Pirsky (surveying), T. Sagiv (field photography), E. Belashov (drafting) and M. Shuiskaya (pottery drawing). East of the current excavation area, another excavation had been carried out in the past (HA-ESI 118). The lot was damaged in the west by pits that were filled with construction debris and in the east by development work. 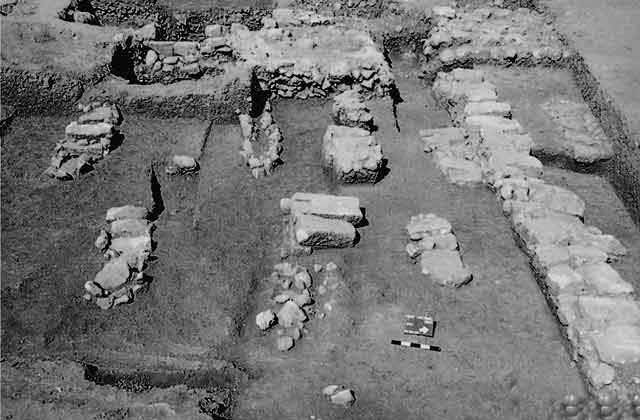 Ten squares were opened in the excavation area (16 × 16 m), revealing walls dating to the Byzantine period and tombs that were not excavated. The Byzantine Complex (Figs. 1, 2) included an infrastructure of fragmented walls that was oriented east–west and built on natural, tamped clay soil. The walls formed a square enclosure, possibly an open courtyard (12 × 12 m), around which rooms can be reconstructed and within which later graves, also oriented east–west, were located. 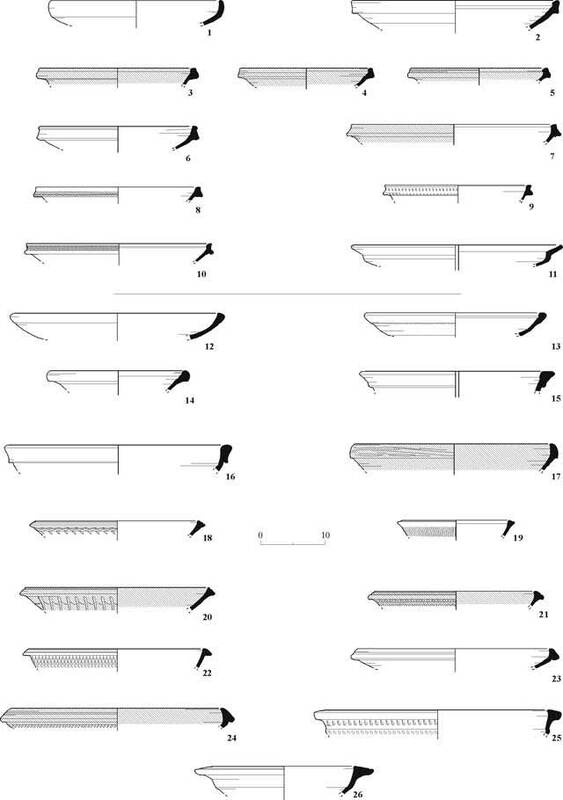 The western part of the complex (length 12 m) included Walls 226 and 237, which were found leaning on their sides, probably due to soil erosion along the slopes of the Karmel ridge (Fig. 3). In the northwestern part of the area the connection between Walls 224 and 226 was severed by a later disturbance of walls (W214 and possibly W215). The eastern part of W224 (length 10 m) was severed by a later disturbance. The southern wall (W228) was also severed and its continuation eastward was not located. It seems that the eastern part of the complex was destroyed by modern development activity. 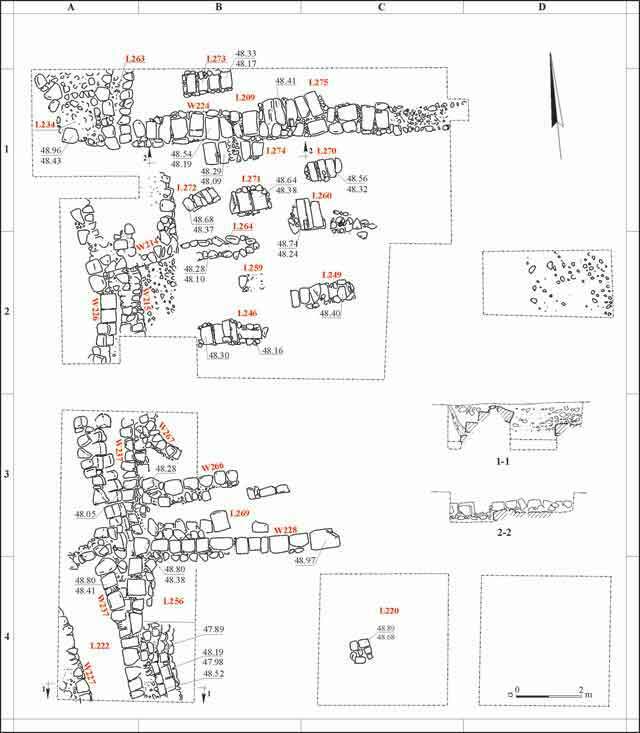 Wall 266, which was parallel to W228, formed a long narrow room (L269; width 1.4 m) that may have been a storeroom. To the south of this room, another room (L220), which was survived by a column base, can be reconstructed, extending as far as the damaged eastern area. A curved wall (W267), probably part of an installation, was exposed north of W266 and next to W237. The room in the southwestern corner of the complex (L222) was situated outside the southwestern corner of the courtyard. The pottery finds were dated to the fifth–sixth centuries CE. Noteworthy were the imported bowls from Phokaia (Fig. 4:1–11) and Cyprus (Fig. 4:12–26) and the African Red Slip bowls (Fig. 5:1–3). Other ceramic finds included a local Galilee bowl (Fig. 5:4), a krater (Fig. 5:5), Syrian mortaria (Fig. 5:6, 7), a cooking krater and cooking pots (Fig. 5:8–10) and jars, among them a Byzantine jar (Fig. 5:11), northern jars (Fig. 5:13–15) and a Gaza jar (Fig. 5:16). The variety and quantity of imported bowls are indicative of a farmhouse or an estate complex. The absence of transition types dates the complex only up to the fifth–sixth centuries CE, prior to the end of the Byzantine–beginning of the Early Islamic periods. Burial Field. Ten pit graves were found dug in the ground. Each grave was surrounded by small fieldstones that supported covering slabs. The graves were not excavated and no datable artifacts were found. 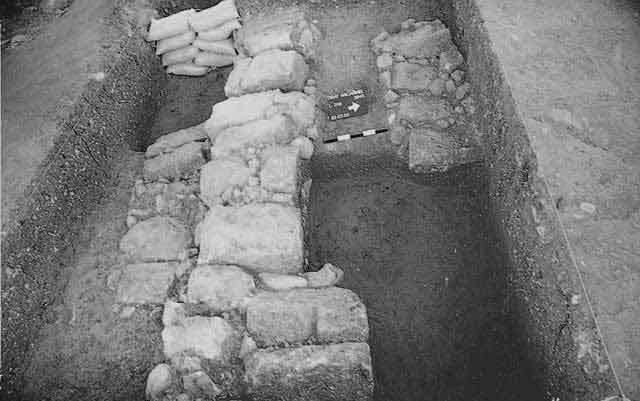 Most of the graves were dug in the area of the open courtyard, at the elevation of the walls’ foundation courses. Grave 273 was located north of W224 and beyond the limits of the courtyard (Fig. 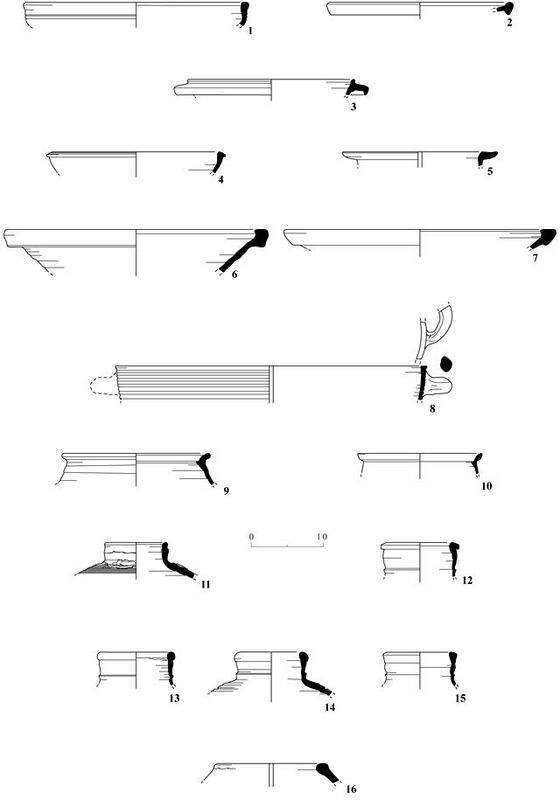 6), whereas Grave 275 was incorporated in the northern face of W224 (Fig. 7) and may possibly indicate that some of the graves were dug after the Byzantine complex was no longer in use. 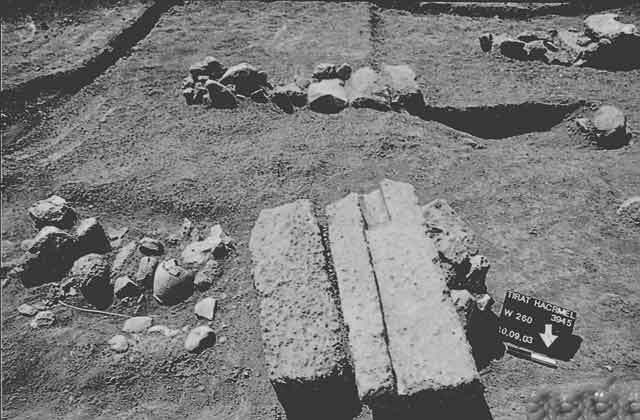 Building stones in secondary use were placed as covering slabs on some of the graves (Fig. 8). The modern disturbance in the western section of the excavation, which destroyed the western part of Grave 274, negated any possibility of dating the tombs to the modern era. The salvage excavation exposed an open courtyard of a farmhouse or an estate that was surrounded by rooms. 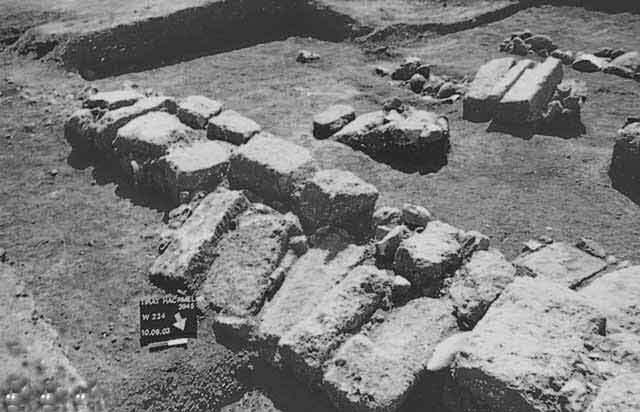 Based on the two winepresses found east of the excavation (HA-ESI 118) it is feasible that the building administered the agricultural and industrial activity in the region. The graves in the area were dug after the Byzantine structure was abandoned, at the end of the Byzantine–beginning of the Early Islamic periods. The graves were probably Muslim burials, based on their east–west orientation. 2. General view, looking west. 3. The southwestern section, W237, looking southeast. 6. Graves 273, 274, looking west. 7. Grave 275, looking south. 8. Grave 260, looking south.